FX Draw Tools Annual Subscription Site Licence for < 1000 on roll. Location: Store Home > FX Draw Tools Annual Subscription Site Licence for < 1000 on roll. FX Draw Tools is the new name for FX MathPack. 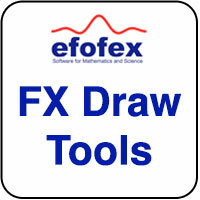 - FX Draw provides a comprehensive drawing environment designed specifically for mathematics teachers. There are specialised tools to draw (and freehand sketch) just about anything (mathematically) imaginable. Bonus Mathematics Tools: Some of FX Draw's tools are so useful that we offer them as separate programs. FX Equation packages FX Draw's equation editor into a powerful, blazingly fast tool for creating equations. FX Graph and FX Stat package FX Draw's graphing tools into products that are useful to students. All three of these bonus programs are included FREE in your FX Draw subscription.